Inspired by the real-life incarceration accounts of young Pinoy Americans between 1966-2008, it is an immersive 60 minute artistic work of creative non-fiction located in the near future 2048, highlighting the state of humanity among Pilipinos in the United States,150 years after the US annexation of the Philippines. 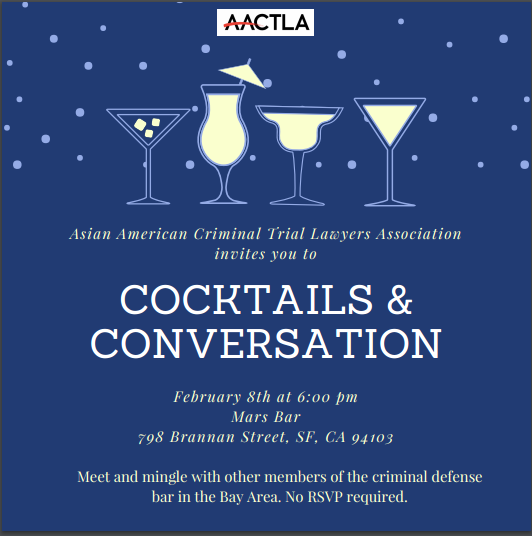 Join AACTLA after the show on opening night for a community discussion panel with Asian American attorneys in criminal and federal immigration court, fighting against a dehumanizing system of mass incarceration. Join us for some drinks, some laughs, and some friends from the criminal defense community! With all the stuff that's going on lately, there will be plenty to talk about! Come hang out! Film Screening and Q&A: "DEPORTED"
The Asian American Criminal Trial Lawyers Association and its sponsors invite you to join us for a film screening of "Deported," a five-part documentary series on NBC Asian American Presents. Q&A with Director Sahra Nguyen and Anoop Prasad and Kevin Lo from Advancing Justice - Asian Law Caucus, moderated by Vilaska Nguyen. The panel will discuss the recent targeting of Cambodian and Vietnamese refugees by ICE and the struggles faced by this community. In 2017, increasingly hostile changes to national immigration policies have created significant challenges in immigrant and refugee communities. The Vietnamese American community is not immune to such changes, with increased deportation detentions at the end of this year. "Advocating Through the Vietnamese American Lens"
Program from 8:30 a.m. - 11:45 a.m.
Networking Luncheon 11:45 p.m. - 12:30 p.m.
Race matters in all criminal cases at every stage of the case. Juryselection is no exception. 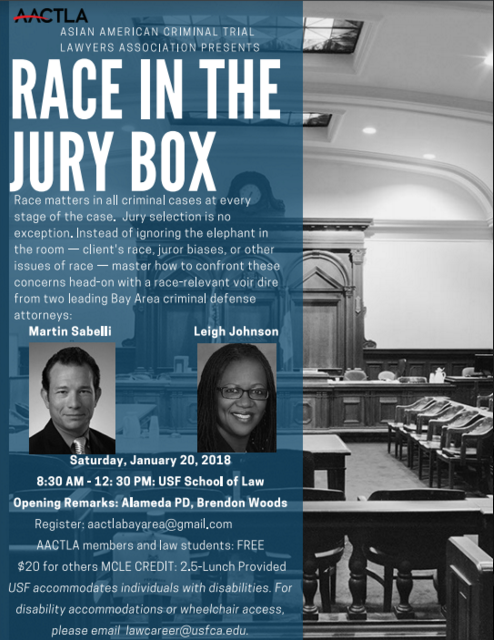 Instead of ignoring the elephant in the room -the color of our client's skin, juror biases, or other issues of race - master how to confront these concerns head-on with a race-relevant voir dire. Free for all AACTLA members and law students, $20.00 for all others. Payments can be made via PayPal or by sending a check to "AACTLA, 1388 Sutter Street, Suite 805, San Francisco, CA 94805." Martin Sabelli has represented individuals in state and federal courts since 1993 in a wide range of civil and criminal matters including complex federal white collar criminal prosecutions, multi-defendant federal conspiracy cases, federal and state gang-related prosecutions, and federal and state death-penalty matters. He has taught for theNational Criminal Defense College (NCDC) since 2001 and for the Trial Advocacy Workshop of Harvard Law School, the National Institute for Trial Advocacy, and the National Association of Criminal Defense Lawyers (NACDL) as well as numerous other criminal defense and public defense programs around the country and abroad. He is the secretary of NACDL and a member of the Board of Regents of NCDC. Leigh E. Johnson is a trial lawyer and founding principle at Law Offices of Leigh E. Johnson. Included under her business brands are: Trial Whisperer, a company which provides trial collaboration, co-counsel, and trial consulting strategies; Law Focus Groups, which conducts focus groups and mock trials to help lawyers understand the way laypersons and jurors might view their cases; and Lawyers and Leaders, which provides detailed analysis, brainstorming, and coaching for lawyers and executives looking for help with strategy and implementation. Leigh is a 2009 graduate of Gerry Spence's Trial Lawyers College (TLC) and has been on staff at TLC since 2010, teaching trial skills to new and experienced lawyers several times a year. Leigh has also lectured on storyline development and focus group methods at Gerry Spence's Death Penalty College and the Capital Defense College in Texas. 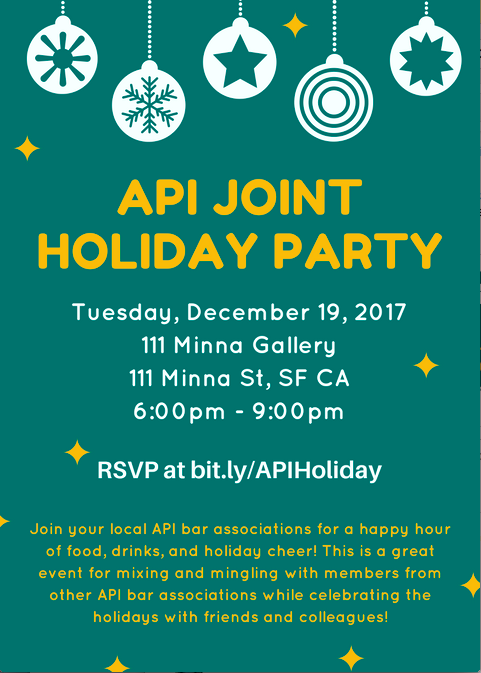 Please join AACTLA and the participating API bar associations for this year's annual API Joint Holiday Party! Appetizers and limited drink tickets to those who RSVP and are members of co-sponsoring orgs. For any questions, please email us at minoritybarcoalition2@gmail.com. Hope to see you there and happy holidays! Please join us for this important and timely training by Saira Hussain from Advancing Justice - Asian Law Caucus on the intersection of criminal and immigration law. Join MBC organizations for great barbeque, heavy appetizers, and drinks. Free admission for AACTLA members, as AACTLA has co-sponsored this event. Catch up with your mentors, mentees, and meet members of the sponsoring bar organizations. Hope to see you there! The theme for this year's gala is "TOGETHER WE RESIST" - we are bringing together the fight for immigration reform, criminal defense, and recognition of basic civil rights in this special night featuring JOSE ANTONIO VARGAS as our keynote speaker. Vargas became an outspoken critic of current immigration policies after he came out as an undocumented person with his 2011 New York Times article. He is also a Pulitzer Price winning journalist and founder of a nonprofit organization, Define American. A portion of the proceeds from this event will go to Define American. We will also present the 2017 JUSTICE AWARD, for a law student that has demonstrated his/her commitment to indigent defense. We are proud to say that both of last years recipients are now practicing public defenders right here in the bay area! Finally, we will honor ASSEMBLYMAN ROB BONTA for his leadership in immigration and criminal justice reform with our OUTSTANDING LEGISLATOR OF THE YEAR AWARD. There is easy parking on the street and in the parking lot connected to the venue! Please visit www.aactla.org/installation-gala for event and ticket information. 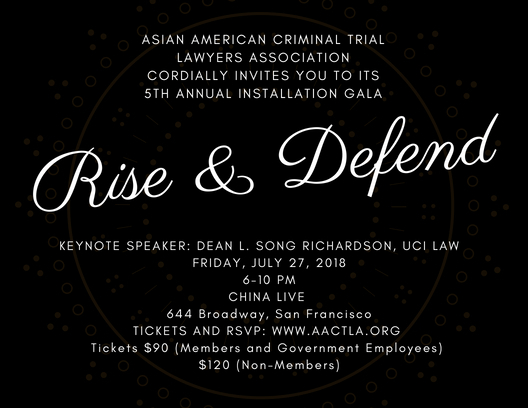 Please join AACTLA, AABA, and CAAM in this presentation of an exciting new film project by Emmy nominated director, Jim Choi, and Jeff Adachi, San Francisco Public Defender and AACTLA member! DEFENDER tells the story of San Francisco Public Defender Jeff Adachi who takes on the case of 22-year old Michael Smith, an African American man who pleaded not guilty in one of the first body camera cases in San Francisco when he was charged with battery on police officers and resisting arrest. This urgent documentary shows how far Adachi and his team will fight for the young man’s freedom while exposing racial bias through all levels of the judicial system. The film also underscores the Public Defender's fight to provide legal representation for detained immigrants facing deportation in the current political era. FREE TICKETS ARE AVAILABLE WITH RSVP! For more information and tickets, click here. Film Screening - "ABACUS : Small Enough to Jail"
Preceded by a short film by Jeff Adachi, "The Ride"
AACTLA proudly cohosts a screening for a film by Steve James (Hoop Dreams), that explores the evocative story of the Sung family-owned Abacus Federal Savings Bank, the only U.S. bank to face criminal charges in the aftermath of the 2008 financial crisis. James documents the family’s trial by judge and their own Chinatown community. AACTLA will host a limited number of tickets for our members, so please contact us at aactlabayarea@gmail.com for your free ticket! This screening of Abacus will be preceded by a short film by San Francisco Public Defender Jeff Adachi, "The Ride". This film takes viewers on a personal and intense ride through the case of a young African American man who is charged with assaulting police officers after being falsely accused of a crime in a case with racial overtones. In this era of mass incarceration and police shootings of young African American men, how do we, as a society, grapple with the issues of racism and implicit bias in policing and its consequences for those who question police authority? CAAMFest is recognized as the the nation's largest showcase for API films, annually presenting 130 works in SF, Berkeley, and San Jose. It has been an important source for new Asian cinema and has been an important launching point for Asian American independent filmmakers since 1982. Please join AACTLA, the San Francisco Public Defender's Office and our many community justice partners in a practical discussion about immigration law and mass deportation. No family should be torn apart because they can't afford an attorney. Learn how San Francisco can provide lawyers to help immigrants fight deportation and how YOU can help. The event is free to all attendees!